It is very important to breathe clean and fresh air especially in this time of pollution. If you think the same, then there is the Kent air purifier now, which will do exactly this for you. When you are back home from work, it is very important to have a fresh feeling so that you can relax properly. This starts with the air you breathe in. Often there are unseen particles that can make you fall sick. But you can now stop all of these just by buying an air purifier of Kent. What to check while purchasing Kent air purifier? Know what type you want for your home. Whether it is pedestal, wall fit or portable that will suit your house the best. Kent has all three of these types. Be sure about how much space you need the air purifier to cover. The capacity will differ depending on whether it is for one room, living area, etc. A superior brand like Kent has products that can purify air of 270 square feet area or a single big bedroom. Air purifiers from Kent, which is meant for a single room, consume around 45 watt of power. This rating goes up which its area coverage rating. Some of Kent products also come with ozone output which is best to kill bacteria completely. What different types of air purification can be expected? Depending on the size and model, Kent air purifier range between Rs.3,000 and Rs. 22,000. Also, check the airflow and adapter for enhanced experience. With this, now you can breathe fresh air at home! The air that we breathe is essential to good health. Is the air that you breathe taken for granted? Case in point, do you “assume” that the air is clean since you clean your home or office on a regular basis? Perhaps you purchased some air purifying plants. While these are beneficial, they often are insufficient in reducing and removing air pollutants. These pollutants are often not visible. They can cause unnecessary health difficulties, or aggravate existing ones. This is the reason air purifiers are beneficial for a healthier living environment, especially for those who have asthma and allergies. Is there a smoker in the house? An air purifier for home will help rid the homestead of second hand smoke. In the following air purifier reviews, we will consider the essentials of purifiers. The features and benefits, pros and cons, will be weighed evenly. 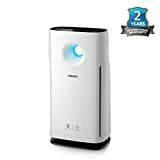 Ultimately, we are looking for the best air purifier in India. 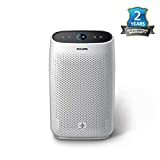 Dr. Morepen 49W Room Air Purifier APF-01 with HEPA Filter, Effective Area 400Sq.Ft. Protects Your Family And Loved Ones From Dust, Allergies, Gases, Smoke Residue (Nicotine), Pet Dander, Bacteria And Viruses. Sometimes in life it is best to stick to the basics, and HEPA filters are the time tested and true way to purify air. With the tiny holes in the filter, they only allow clean air to pass through, effectively trapping the pollutants. There are some HEPA filters that can trap bacteria and some viruses. These are recommended in part because they do not emit ozone. Look for a HEPA machine that will filter at least 90% of the air flowing through it. A newer design in purifiers is electrostatic. They way these work is by drawing air into an ionizing chamber. Once this air is drawn in, a small charge is placed on the particles to enable them to stick to the filter. The easiest analogy is to think of a magnet. The size of particles that can be captured can be as small as .1 microns. In order for a light system to be effective, it should be used with a filter system. Some of the more effective purifiers that use ultra violet light also use a HEPA filter in conjunction. Coated with titanium dioxide, a photocatalytic oxidation filter produces ions which are highly reactive as well as electrons. These actions occur when they are combined with a UV light. These actions help capture bacteria, gases, and viruses once they come into contact with the filter. Once attached to the filter, the ions destroy the pollutants through the oxidation process. Extreme care should be taken to ensure the purifier that you purchase for your home or place of business does not emit ozone. Damage to your lungs can occur as a result of inhaling ozone. Other symptoms of ozone inhalation are shortness of breath, chest pain, coughing, and irritation to the throat. Be cognizant of terms that some manufacturers use such as “plasma”, “pure air”, and “energized oxygen”. These are terms, or descriptions if you will, that are commonly used to lead the consumer to believe that ozone is healthy. In fact, it is a dangerous gas. 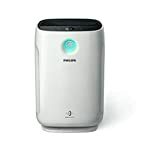 While each one of the following air purifiers would make a great addition in any home or office, it is virtually impossible to narrow down the options available. The reason for this is simple, it is dependent upon the intended use. Use the information provided, and bear in mind the size of the room. If there is concern over the potential for ozone being emitted, consider an air purifier that does not have an ionizer. No worries with ozone on this model, as it is 100% ozone free. Looking to capture pollution, bacteria, allergens, and viruses? This Philips model has a dedicated auto mode for these purposes. With the professional grade sensing technology and real-time PM measurements, this air purifier is sure to bring a “breath of fresh air” into your room. New HEPA filter technology is at your disposal with this Atlanta Healthcare model air purifier. This model is perfect for smaller rooms or an office. Why settle for the least when you can have the best with the 7-stage air purification system. With this multi-stage air purification system, you can be certain that your room air purifier is keeping your air clean and healthy. From one of the leading brands of home appliances in India comes this 45-watt air purifier with HEPA technology. 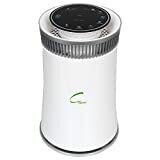 With a built in ionizer and a specially treated carbon filter to grab some of the more foul pollutants, this compact air purifier for home is sure to provide clean air for your family. A Silver A Design award winner, this Honeywell Air Touch purifier is the perfect complement for your bedroom or living room. With a 3-stage advanced filtration system, this purifier can capture 99% of the pollutants in your airspace. With a high grade HEPA filter and best in class airflow design, this Honeywell model will provide the user with countless hours of clean and efficient air purification. Nanoe technology is at work in this Panasonic 20-watt air purifier. For those that are not familiar with how nanoe works, it is a new development from Panasonic to neutralize bacteria and viruses. One of the benefits of this model is that it senses when air quality goes down and automatically increases filter speed. 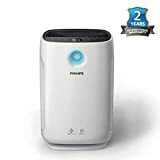 Before we begin our review of this Philips 1000 air purifier, be sure to remove the clear polythene covers on the 3 filters! It is a common mistake. With a coverage area up to 677 square feet, this model is perfect for the larger bedrooms, living rooms, or offices. Look for this model to capture the smallest of pollutants with its Intelligent Purification System technology. While this Daikin is larger in size, it makes up for the inconvenience in performance. For the larger room in your home, this purifier can handle the square footage as it can cover up to 600 square feet. With a 6-stage filtration system and a 4-stage speed control, this Eureka purifier is a good mixture of science and visual appeal. The Aeroguard Mist is designed to capture 99.9% of the airborne allergens and pollutants. For those with breathing difficulties, many customers who have been using this product report quick improvements in their overall health. 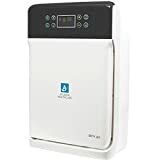 While the cost of this Sharp purifier may be higher than some other models, it makes up for this in features and benefits. With an industry high CADR of 480m3/H and a combination of filtration technology, this model is more than suitable for any home or office. With a well respected CADR of 350 cfm and quiet operation, this Blueair will work well regardless if it is an office space, bedroom, or living room. Many room air purifiers have fans that have 2 blades, this Blueair has a fan that has 4. Why is this important? More air movement. This includes pollen, dust mites, mold, dust, and pet dander. All people have some level of reaction to these allergens. Smoke from cigarettes, air pollution, pollutants from a nearby factory or petroleum station. This category also encompasses commonly used chemicals for cleaning and pet odors. If you have a compromised immune system, then look for an air purifier that will remove bacteria and viruses. 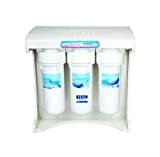 For those with asthma, bronchitis, or other serious health conditions, purifiers that can safely remove these will prove beneficial to long term health. One common misconception is that air purifiers are for the entire home or office space. This is misleading and not true. The majority of purifiers on the market today are for a specific room. Take for example a purifier that advertises that it can clean a 1200 square foot area. In order for this to be accurate, the 1200 square feet area would have to be free of any air obstructions, such as corners, walls, or stairs. Manufacturers calculate their square footage areas based on an 8 foot ceiling height. This calculation is under the assumption of the purifier operating at full speed. For example, if you have a 10X10 foot bedroom, it is considered to be 100 square feet, with an 8 foot ceiling height. The general rule of thumb is to choose a room air purifier with approximately double the capacity in your square footage. This is due to any noise that may come when it is in operation, as well as heightened air circulation. 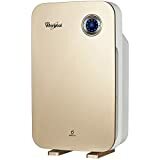 Most people find that the best utilization of air purifiers is to run them at full speed when the room is not occupied and to then lower it when the room is occupied. 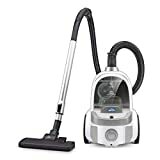 The Clean Air Delivery Rate (CADR) is an established standard by the Associates of Home Appliance Manufacturers (AHAM), and this is done in conjunction with product manufacturers. What does this rating mean? The CADR rating is a determining factor in how well the purifier reduces pollutants. For the purifier customer, this rating can be helpful in determining maximum room size for the unit. It is important to note that not all purifier manufacturers are members of the AHAM. The companies that are not affiliated should not be disregarded, as they may find the testing to be limited and the cost prohibitive. Some of the machines not ranked by AHAM are actually more efficient than ones that are.